The Blog Party winnings are complete... 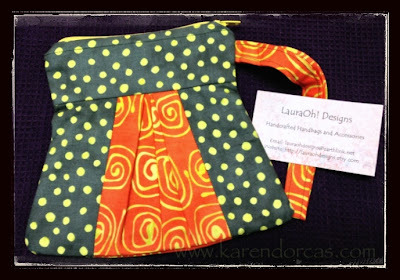 I just received this beautiful wrist bag from LauraOh at "LauraOhDesigns.com" and it is fabulous - such meticulous and detailed sewing - perfection! I feel blessed to be the recipient. Thanks so much, Laura. Just a little FYI - I took the photo with my iPhone5 and then did a bit of cropping and framing with my new "PhotoShop Touch" app... the watermark is done with I/M because I haven't figured out how to make the lettering smaller with the new app. Will need to visit the tutorials. Was fun doing on my iPad. Hugs. What a fun surprise. Gosh, the GYB party was so much fun, wasn't it!! What a cute bag! Congratulations! That's really cute and the fabric design is so "you"!